A certified pre-owned vehicle from Crown Alfa Romeo of Dublin is more than just a used car. Each one of our precision-engineered Italian sportscars are like-new quality and come backed by a manufacturer warranty. So, you can focus on what really matters - enjoying your new certified pre-owned vehicle. Unfortunately, not every certified used vehicle program is the same. When you choose to drive a certified pre-owned vehicle from us, you'll get huge benefits that private sellers and other pre-owned programs don't offer. Crown Alfa Romeo of Dublin provides you with a selection with coverage that can't be beat. No matter which one of our prestigious certified pre-owned vehicles you drive, it will be covered with plenty of benefits. 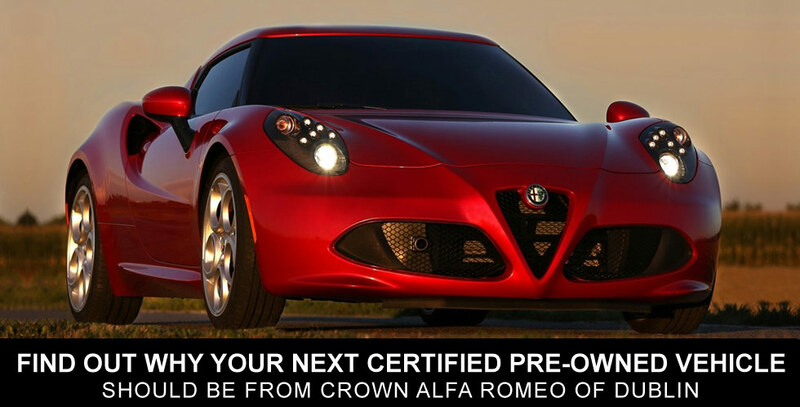 Explore our available selection of certified pre-owned vehicles when you visit us at Crown Alfa Romeo of Dublin!